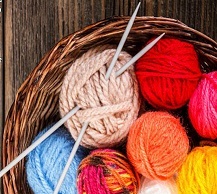 NEW GROUP FORMING for yarn crafting enthusists who use crochet or knitting needles and want to meet with others who share your interest. This first meeting will be a "meet and greet" ; all skill levels welcome. Help decide the meeting format and schedule for the rest of the year. Perhaps you'd like to bring a project, get help with something, or share an idea. It's your group - you decide!